All of the books on this download are non-governmental publications and cover in detail, training for espionage and learning tradecraft. All 14 publications originate from J-CAD, a Joint Covert Applications Directorate, and are original and the sole copyright is owned and distributed only by eMilitary Manuals. 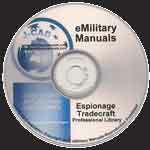 AGENT ACQUSITION AND EMPLOYMENT-This manual details locating, approaching, securing and deploying an intelligence agent. Contrary to popular belief, an agent is not a member of an intelligence service, but rather a paid employee/informant with access to organizations, information or personnel of intelligence interest. BASIC ASSOCIATION ANALYSISFOR INTELLIGENCE OFFICERS-Intelligence analysts use various tools to identify and illustrate apparent links between organizations and persons of interest. All intelligence operators are required to include association analysis charts and graphs in their reports. This manual takes the reader through the logical process of association analysis. INTELLIGENCE FUNDAMENTAL-An excellent primer on intelligence concepts. This manual is part of the induction package for all new Espionage Tradecraft operators. Brief, but succinct and to the point. COVERT METHODS OF ENTRY REFERENCE – INTRODUCTION TO KEY CASTING-This manual takes the reader through the process of duplicating a stolen key for later exploitation of target premises. The manual instructs the reader how to use standard equipment used by intelligence agencies worldwide to make a hasty duplicate of any key. COVERT METHODS OF ENTRY REFERENCE – SECURITY EQUIPMENT GUIDE-Details the various types of locks, safes and access control systems used in government and industry today. COUNTER/ANTISURVEILLANCE PROTOCOLS-Written from the perspective of the “Rabbit”, this manual shows bulletproof methods of dealing with hostile surveillance. This may be the definitive text on the subject. COVERT METHODS OF ENTRY REFERENCE – PERIMETER SECURITY SENSOR TECHNOLOGY-This manual details types of alarm systems used in government, business and other areas. The manual covers characteristics, holistic system approaches, false alarm rates and defeat principles. This manual was developed as a training aid for government intelligence personnel conducting CME (Covert Method of Entry) "Burglary and Buggery" operations. BASIC COVERT SURVEILLANCE PROTOCOLS FOR INTELLIGENCE OFFICERS-Details standard surveillance tactics, techniques and procedures. Covers communications, static surveillance, vehicle surveillance and foot surveillance. Very comprehensive. COVERT RURAL/REMOTE AREA SURVEILLANCE: Tactics, Techniques & Procedures For Intelligence Officers-This manual instructs in the fine art of surveillance in the wild. It covers vehicles, hides/Ops, communications, equipment and more. BASIC DEAD DROPS: PROCEDURES FOR INTELLIGENCE OFFICERS-Non-verbal communication is an essential element of any espionage operation. This manuals guides the reader through classic methods of conducting “Dead Drop” operations as well as the modern update – the “virtual” dead drop. INTERROGATION APPROACHES FOR THE COUNTERTERROR INTERROGATION-This manual is a reference which details common effective approaches used by both friendly and threat personnel. It is useful for both the interrogator and the interrogatee. TACTICAL VEHICLE OPERATIONS: Tactics, Techniques & Procedures For Intelligence Officers-This manual is designed for personnel who may come under hostile surveillance or attack while operating a motor vehicle. Whether the attack is an attempted arrest, carjacking, kidnapping, or terrorist assassination, the response is the same, to get out of the situation quickly. The goal is to help train the driver how to use his vehicle as a means of escape or weapon for survival. TACTICAL RECOVERY OPERATIONS SUPPLEMENT-This manual details obscure topics such as procuring black market weapons overseas, pre-raid intelligence gathering and assassinations. A supplement to another series of manuals which are yet to be released. IARM 21-9-3: Intelligence Analysis Reference Manual-Analysis Training Handbook Classified: For Official Use Only This handbook is designed to help analysts in the Intelligence Community become more effective at their craft. The handbook articulates the philosophy and mission of intelligence officers and systematically lays out principles they can use to conceptualize and create written and oral products. Officers can adapt these principles to their individual accounts, from substantive analysis to staff and administrative work. The skill portions of the handbook focus on tools for strengthening officers' ability to arrive quickly at an overall judgment and make a case for it and to communicate both clearly and concisely. Emphasis is on written communication, but the principles of analytic writing clarity, brevity, and precision-apply equally to oral presentations. The sections on analytic objectivity provide officers with guidance on avoiding bias and increasing objectivity, techniques for building their analytic sophistication, and areas in which they can seek additional training.